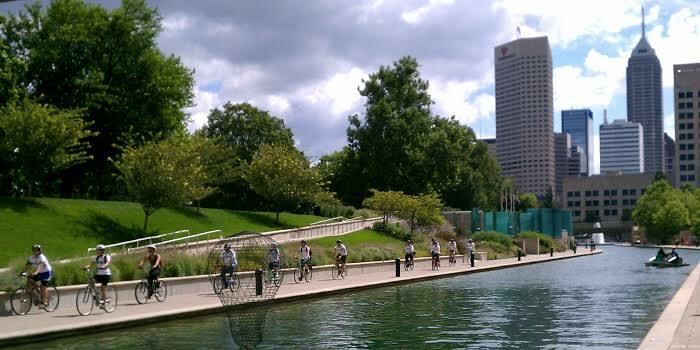 Enjoy the tail-end of Spark Monument Circle by exploring Indianapolis by bike through the final ride from this series of self-guided tours developed by ActiveIndy Tours! This 9.5 mile route showcases the connectivity of three trail systems on the northside of downtown. Cyclists will enjoy fall’s display of colors while exploring the Cultural Trail, Monon Trail, and Fall Creek Trail before returning to the Circle via the historic neighborhoods of Fall Creek Place, Herron-Morton, and the Old Northside. Check in at the Welcome Trailer before departing to view a route map and receive a cue sheet of directions for the ride.